Current information from the IMAGE spacecraft shows that the battery is fully charged, and that overall, the satellite itself seems to be in good shape. The next step is to attempt to turn on the science instruments – but this could take some time as the 12-year-old software to do so must be recreated. Additionally, as computers have evolved greatly in that time, work is being done to find a machine that can run the instrument commanding software. What caused the spacecraft to reboot and begin sending signal again? As we move forward, NASA is starting to recreate a small control center that can generate the commanding needed to better understand and control the satellite. This will then allow us to gain insights into the state of various science instruments, and see whether any are still functional. Should any of the instruments be functional, NASA will convene a panel of external scientists to assess the science potential in the context of constrained budgets for operating spacecraft. New data regarding IMAGE provides some additional — though not yet complete — information on how the spacecraft began to transmit signals again. On Thanksgiving Day in 2004, the IMAGE spacecraft — at that time still fully functioning — underwent an unexpected power distribution reboot, after which the power returned only on one side — labeled the B side — of the unit. (Satellites are usually built with redundant hardware, often called “A sides” and “B sides.” In the event one half fails, operators can switch to the other with minimal effect to the mission.) Scientists involved in the mission concluded that the A side had failed, and proceeded for the rest of the mission exclusively with the B side. However, data from today’s telemetry with IMAGE indicate that the spacecraft’s power unit is now operating back on its A side. The ultimate cause of the reboot is still not known, but these recent findings suggest that a reboot in some form has, in fact, occurred. The identity of the satellite re-discovered on Jan. 20, 2018, has been confirmed as NASA’s IMAGE satellite. On the afternoon of Jan. 30, the Johns Hopkins Applied Physics Lab in Laurel, Maryland, successfully collected telemetry data from the satellite. The signal showed that the space craft ID was 166 — the ID for IMAGE. The NASA team has been able to read some basic housekeeping data from the spacecraft, suggesting that at least the main control system is operational. Scientists and engineers at NASA’s Goddard Space Flight Center in Greenbelt, Maryland, will continue to try to analyze the data from the spacecraft to learn more about the state of the spacecraft. This process will take a week or two to complete as it requires attempting to adapt old software and databases of information to more modern systems. After an amateur astronomer recorded observations of a satellite in high Earth orbit on Jan. 20, 2018, his initial research suggested it was the Imager for Magnetopause-to-Aurora Global Exploration (IMAGE) — a NASA mission launched into orbit around Earth on March 25, 2000. Seeking to ascertain whether the signal indeed came from IMAGE, NASA’s Goddard Space Flight Center in Greenbelt, Maryland, coordinated the use of five separate antennas to acquire radio frequency signals from the object. As of Monday, Jan. 29, observations from all five sites were consistent with the radio frequency characteristics expected of IMAGE. Specifically, the radio frequency showed a spike at the expected center frequency, as well as side bands where they should be for IMAGE. Oscillation of the signal was also consistent with the last known spin rate for IMAGE. IMAGE was designed to image Earth’s magnetosphere and produce the first comprehensive global images of the plasma populations in this region. 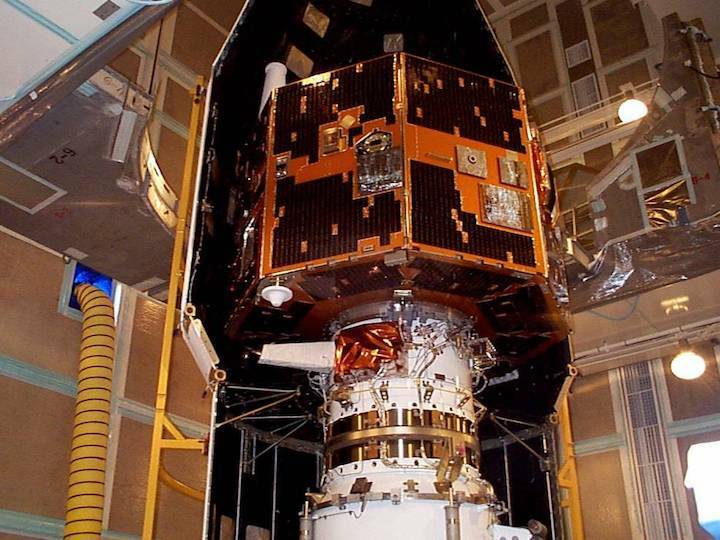 After successfully completing and extending its initial two-year mission in 2002, the satellite unexpectedly failed to make contact on a routine pass on Dec. 18, 2005. After a 2007 eclipse failed to induce a reboot, the mission was declared over. In mid-January, an amateur astronomer reported they believed they had made contact with a NASA satellite called Imager for Magnetopause-to-Aurora Global Exploration (IMAGE). IMAGE launched on March 25, 2000, and contact was unexpectedly lost on Dec. 18, 2005. NASA’s Goddard Space Flight Center in Greenbelt, Maryland, has acquired time on the Deep Space Network (DSN) to focus on the source and determine whether the signal is indeed IMAGE. This process must take into consideration the vintage nature of the spacecraft, and includes locating appropriate software and commands to potentially operate the mission. We will share more information as it becomes available.